Since the advent of globalization, several new forms of business have been introduced in the market. One of the most exciting and profitable of them is the binary trading business. All a trader has to do is to invest money on the probable price movement of the underlying asset. If the prediction matches the actual movement, the trader can have a good return on his investment. One such trading platform is The IkkoTrader, which is an online trading platform and has become a favorite medium of making money in this trade. The platform is easy to use and can be an ideal choice for those who are new to the business. With a view to offer binary traders a unique trading experience, IkkoTrader was introduced in 2010. Since its inception the platform has been able to live up to the expectation of the people by catering to their requirements down to the last detail. It is headquartered in British Virgin Islands and serve clients from all over the world. Investors can trade in binary options in a hassle free manner and can also secure a good amount of profit within a very small time. 19 stocks, 13 currency pairs, 6 commodities and 21 indices are enlisted in the asset index offered by IkkoTrader. This extensive collection of assets helps traders to choose from the options the one that suits them the best. Different types of assets behave differently under different market conditions and so it is important for traders to be aware of the aspects of each of the asset before making a choice. More the number of assets, better the chance of the trader to succeed in the business. Those who need a payout higher than the average market standard can also opt for IkkoTrader. Most of the other trading platforms at present offer a payout between 65 and 71 percent whereas IkkoTrader offers a payout of 68 to 75 percent on the trades that end in the money. Thus a person investing $100 can easily earn $168 to $175 if he is able to make the right prediction. In the case of the trade that ends out of money, the trader gets 5 to 10 percent of his investment in return. Such a high level of payout allows traders to ensure their desired profit quite easily. Trading methods offered by IkkoTrader includes the conventional binary options as well as the Options Builder, One Touch, Sixty Seconds and Open Platform. All these options provide a lucrative choice for traders who can easily garner some quick and hefty profits. However, different types of trades offer different levels of payouts and so traders have to be careful enough regarding their choice. Trading platform is 100% web-based, allowing the user to instantly trade from anywhere in the world without the need to either download or install any software. New trading solutions are also provided by it. 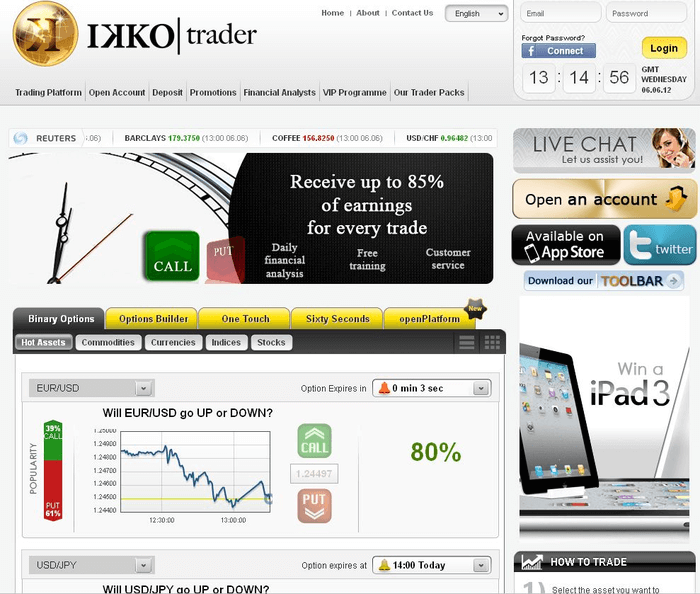 The customer support service offered by IkkoTrader is at par with the international standards. Traders can interact with the support executives in seven different languages that include Portuguese, Italian, Russian, German, Spanish, French and English. The service is provided from 8 am to 10 pm for six days a week from Sunday to Friday.